Since co-founding the first CONvergence in 1999, I’ve drawn unique, custom badge art for every CONvergence Guest of Honor, every year. 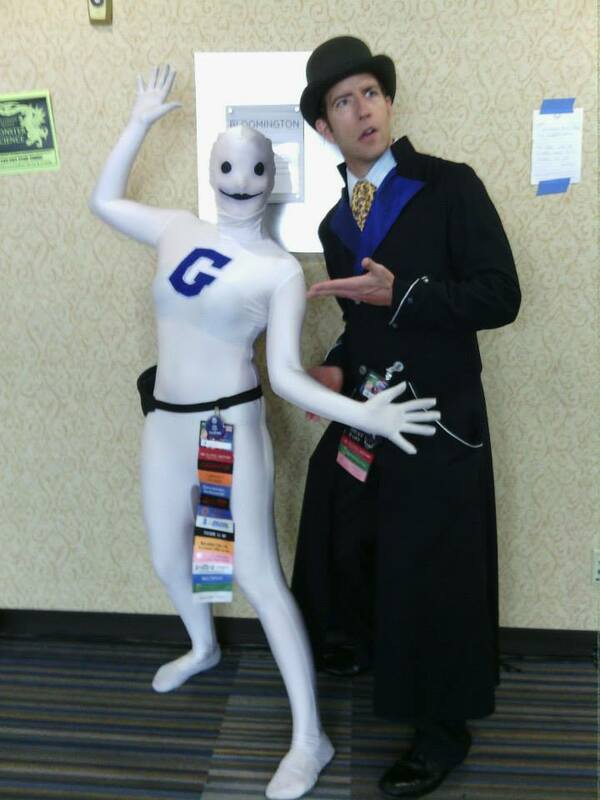 It’s time consuming, but I believe—both as a convention runner and as a frequent guest at conventions myself—that it creates a powerful first impression towards CONvergence being a unique convention experience. I usually try to reference something from a given guest’s body of work in a clever way, as well as try to incorporate our mascot, Connie, on badges for Guests who have been to CONvergence before and are already familiar with the character. Here are the custom Guest of Honor badges I created this year for our CONvergence 2015 Guests. 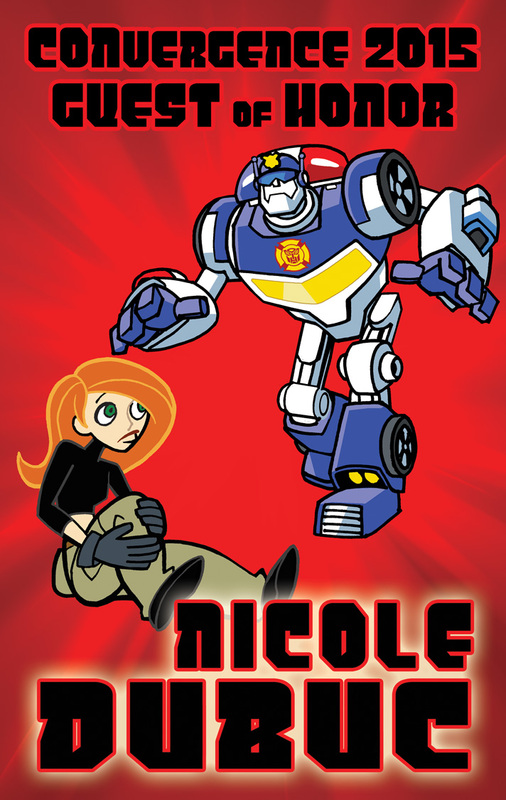 You can follow Nicole Dubuc on Twitter as @NicoleDubuc. Chad Frey has been a set designer and art director on more films that I could even begin to work with, and I didn’t really know which were favorites or his level of contribution to each beyond the job title. I ended up focusing on his design work for Oz the Great and Powerful and had elements from his other films swept up by the cyclone, including references to Transformers, Cloverfield, The Green Hornet and even Mad Men. Learn more about Chad Frey on his website, www.FreyArt.us. 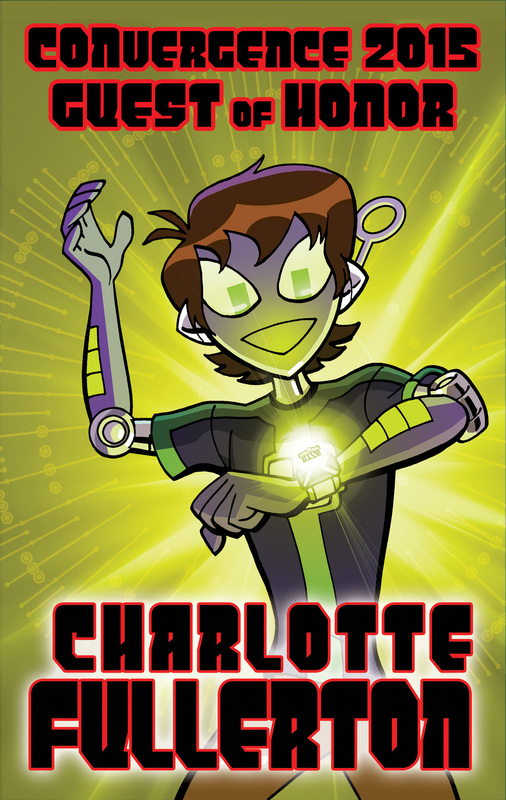 While I try not to over-use Connie on our Guest Badges, I knew it was safe with Charlotte. She’d been to CONvergence before when her late husband (the great) Dwayne McDuffie was a Guest of Honor, so she knew who Connie was. It was kind of a no-brainer to dress Connie up as Ben 10, as that franchise has dominated much of Charlotte’s career for several years, including her role as story-editor on Ben 10: Omniverse. You can follow Charlotte on Twitter at @TheCFullerton and on Facebook at The Charlotte Fullerton Page. I have to note that Lee was fantastically funny our annual, very silly SMACKDOWN! panel. It was great getting to spend some time chatting with Lee over the con weekend! Learn more about Lee Harris at his blog, www.LeeHarris.com, and follow him on Twitter as @LeeAHarris. Sadly Jennifer is the one Guest of Honor I never managed to meet face-to-face over the convention weekend. 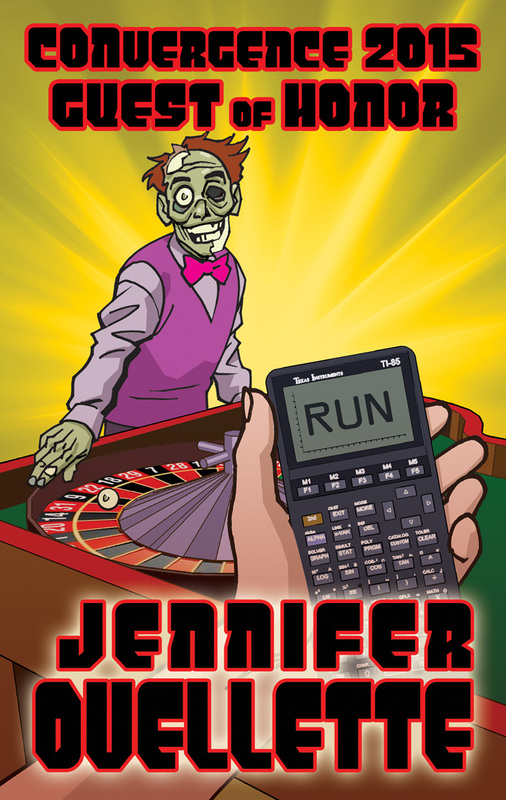 All you really need to know about Jennifer’s badge art is that one of her books is titled “The Calculus Diaries: How Math Can Help You Lose Weight, Win in Vegas, and Survive a Zombie Apocalypse.” I feel like I nailed 3 out of 4 elements of that title. All four if you consider bits of a zombie being missing as weight loss. Jennifer writes the blog, Cocktail Party Physics for Scientific American. You can learn more about Jennifer Ouellette on her website, www.jenniferouellette-writes.com, or follow her on Twitter at @JenLucPiquant. 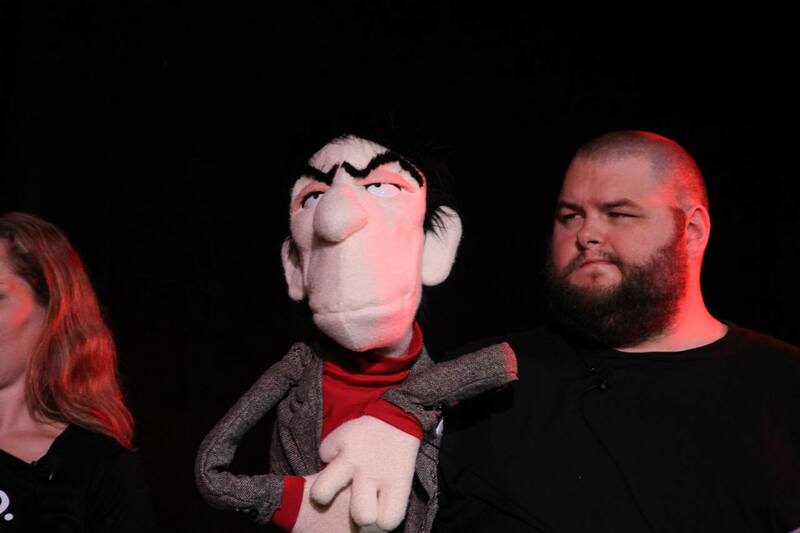 You can see many more of Gordon’s puppet creations at www.thepuppetforge.com. Another stumper: Toni Weisskopf, publisher of Baen Books. 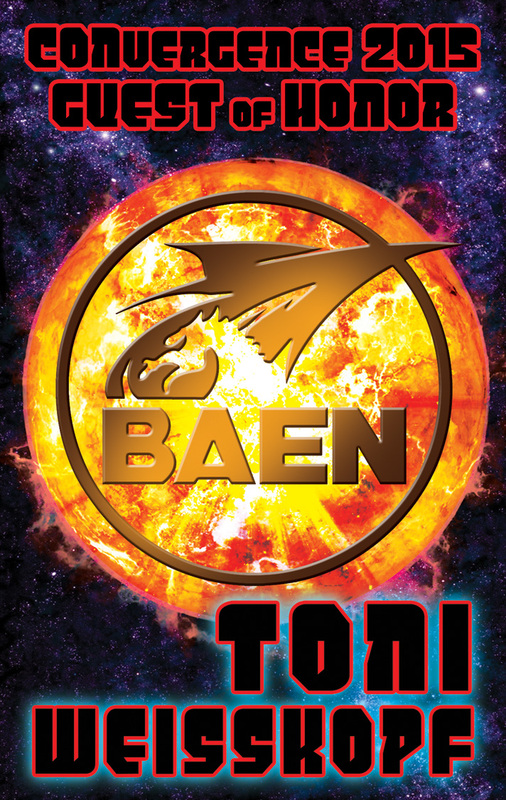 I didn’t want go to the “portrait” option for a third time, so instead I did a fun graphic treatment of the Baen logo. I lucked out again as Toni loved it. I don’t think I ever saw her face-to-face again after the Guest Reception on the night before the convention properly began, so I hope she had a great con weekend! And finally, Bryan Thao Worra was another 2015 guest I’ve been lucky enough to have been friends with for a few years. When I asked him about badge art preferences he mentioned a couple of options, including adding something to his collection of Naga artwork. So for a multi-year attendee CONvergence panelist, one more Connie. This one being Connie as a Naga, with each of the Medusa-like crown of snakes sporting their own Connie-style antenna. You can learn more about Bryan Thao Worra at his blog, thaoworra.blogspot.com, and follow him on Twitter as @thaoworra. So that wraps up all of the CONvergence 2015 badge art. You can check out my 2014 blog posts featuring the CONvergence 2014 Guest of Honor Badges and the CONvergence 2014 membership badge art as well! And if you’re interested in checking out more badge art from previous years, I’ve got most of it posted on my blog under the “Badge Art” tag – click here to check it out! There are too many friends connected with and people to thank to list them all here, but I wanted to share some highlights I thought might be of interest. 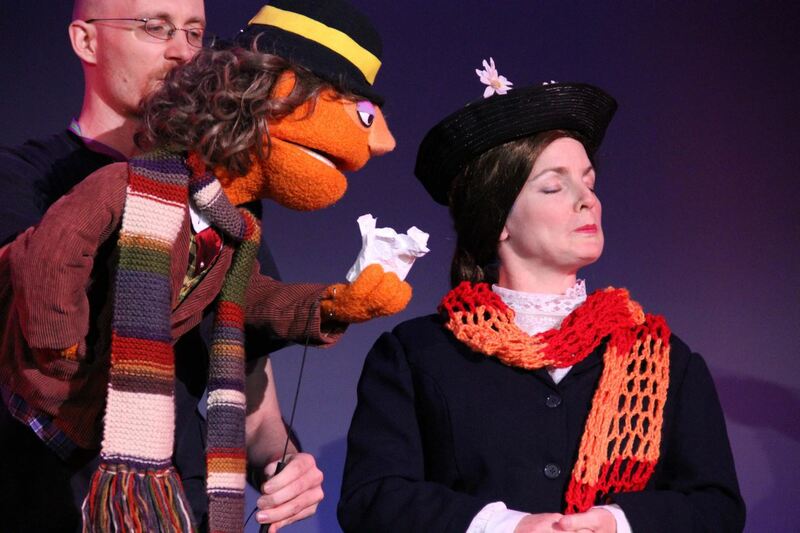 CONvergence Opening Ceremony began with a live musical sketch called “Avenue Who,” which is basically what would happen if Avenue Q and Doctor Who made sweet, sweet love and had a baby. 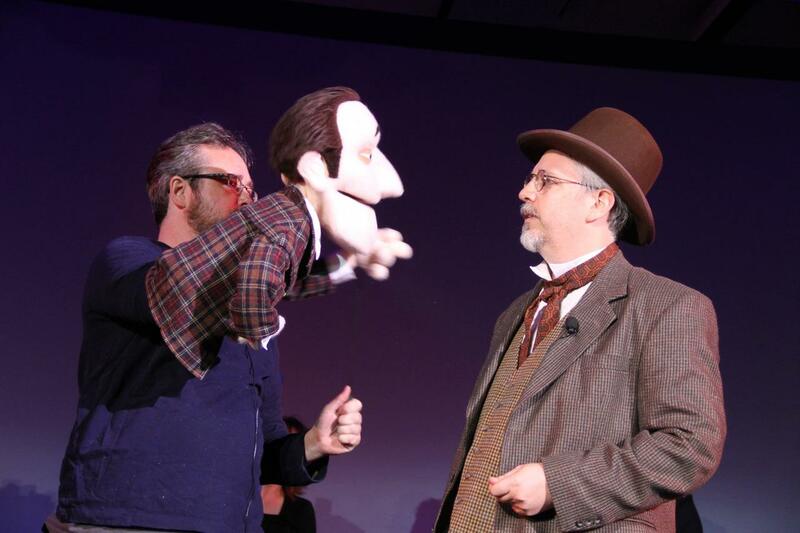 It was written by Tim Wick, Chad Dutton and Gordon Smuder, with puppets built by Gordon Smuder. 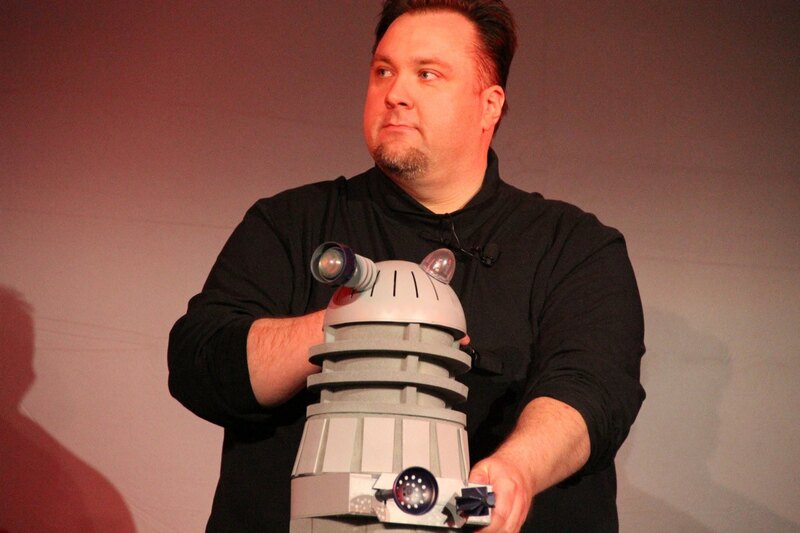 Did I mention that The Dalek (me) had a song? 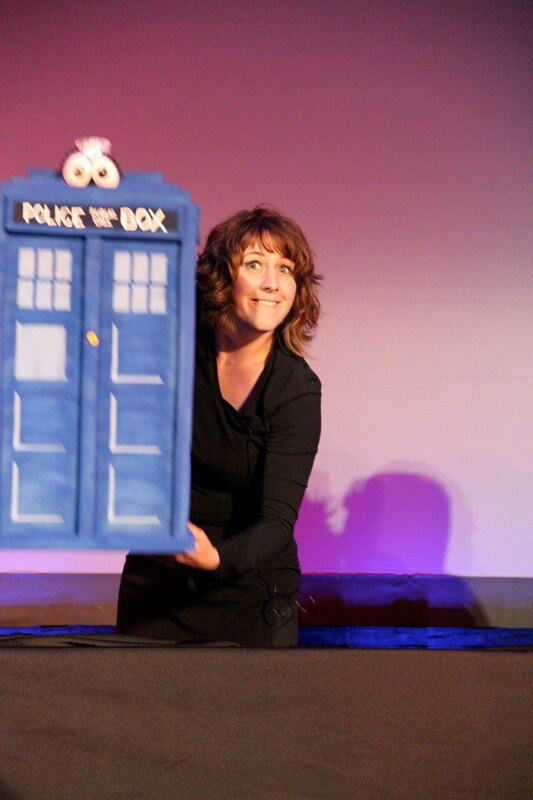 The TARDIS (Courtney McClean) spoke like a Minnesota mom. One of the year’s Guests of Honor was Caitlin Blackwood who played young Amelia Pond on Doctor Who, and now at the age of 13 our first guest to be younger than the convention! Filmmaker Emily Hagins was 14 when she was first a CONvergence guest. Now 20, Emily was in attendance and in a completely unnecessary display of pop and circumstance, helped us crown Caitlin as our new Youngest CONvergence Guest of Honor. 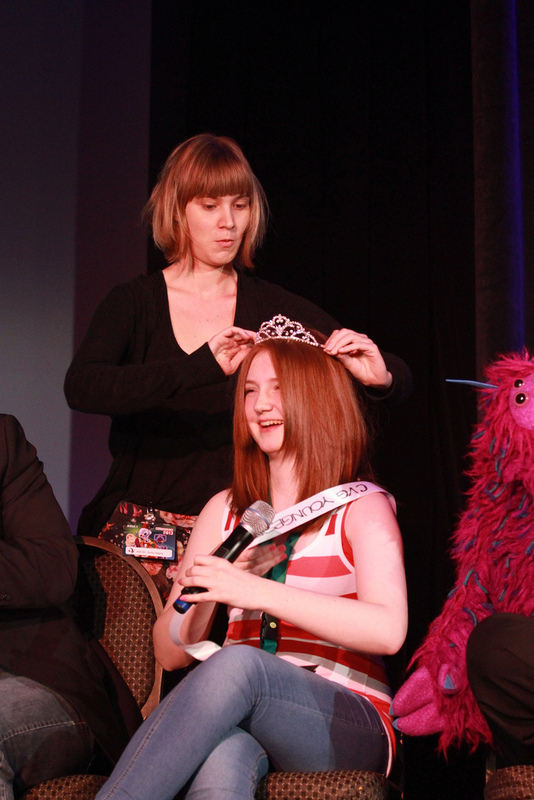 Emily Hagins crowns Caitlin Blackwood as the new Youngest CONvergence Guest of Honor. Photo by Peter Verrant. Opening Ceremony concluded with a special appearance by Inspector Spacetime as played by Travis Richey, who Hal Bichel and I had arranged to bring to CONvergence after having met him at the Gallifrey One convention. Hal and I are big fans of both Community and his Inspector Spacetime character’s unofficial spin-off Untitled Web Series about a Space Traveller who Also Travels Through Time, but after meeting Travis at Gally, we knew that he was really great with fans, good on a panel, and trying to build awareness of his Kickstarter campaign for Untitled Web Series season 2. 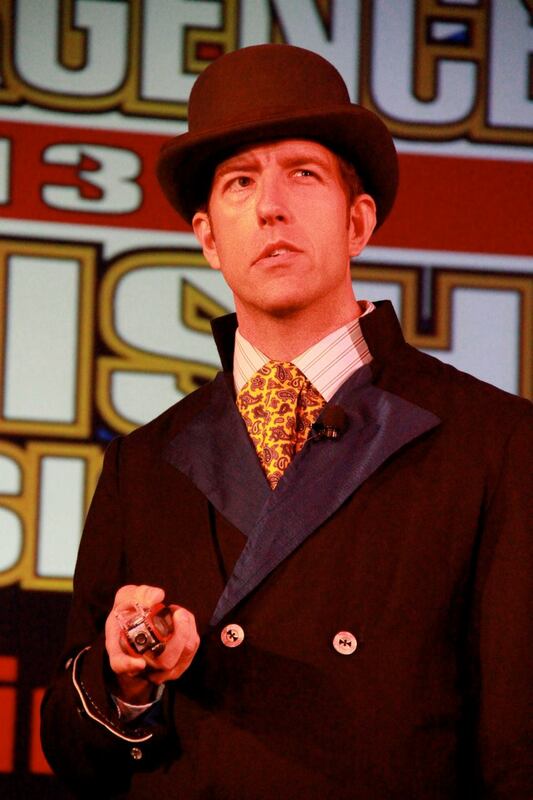 It just seemed like Inspector Spacetime at CONvergence 2013: British Invasion HAD to happen. Optic Pocketknife at the ready! Travis Richey backstage in the MainStage Green Room with Connie and Dawn Krosnowski. Later in the weekend, Travis debuted the Untitled Web Series Season 2 Teaser Trailer as part of his Inspector Spacetime panel, which revealed that plans for Season 2 include Guest Star Robert Picardo from Star Trek: Voyager. You can see the trailer here and contribute to the Kickstarter. One of the contribution incentives is an Inspector Spacetime print by me, which will be revealed in the coming days! 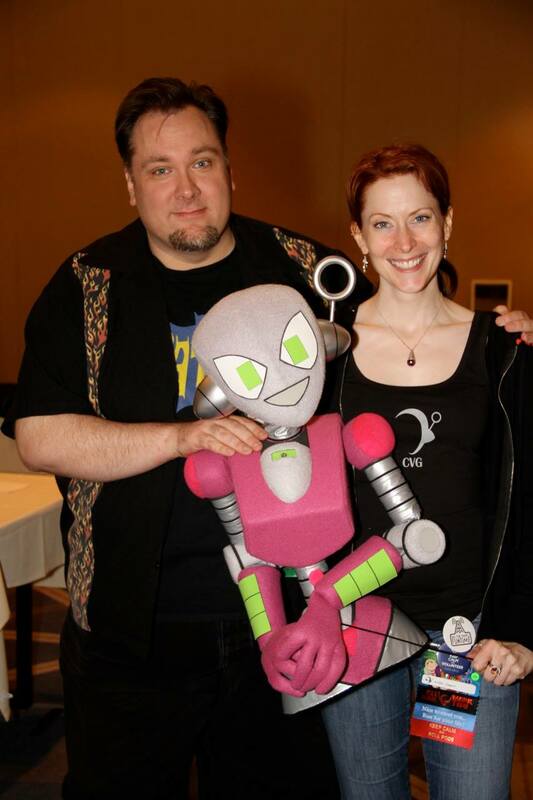 I’d like to thank Travis for coming to CONvergence and being such a good sport about joining in our shenanigans, Hal Bichel for organizing the IndieGoGo campaign that helped us cover the cost of bringing Travis to the con, and of course everyone who contributed to the campaign! 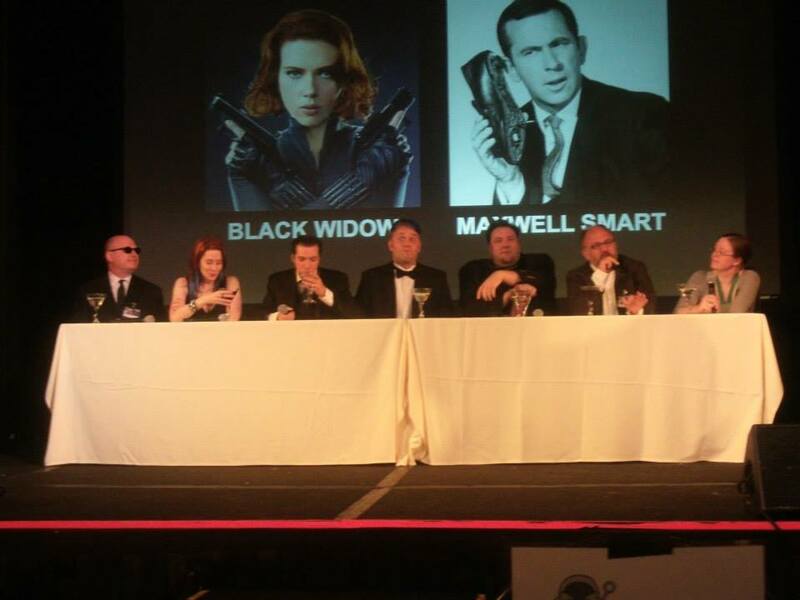 Immediately after the Opening Ceremony was this year’s SMACKDOWN panel, which this year was S.U.P.E.R.S.P.Y. Smackdown. The competitors ranged from Jason Bourne and The Black Widow to Inspector Gadget and Danger Mouse, but eventually Emma Peel won the day! And yes, we had a James Bond lightning round that pitted Daniel Craig’s abs against Sean Connery’s accent. You know, this isn’t the most serious competition… Big thanks as always to co-conspirators Tim Wick who acted as Emcee, and Melissa Kaercher to handled created and operated our Video Scoreboard. Thanks also go to Romeo Azar who created our intro video! From Left to Right: Kelvin Hatle, Dawn Krosnowski, Joseph Scrimshaw, Jeremy Stomberg, Christopher Jones, Tim Uren, and Caroline Symcox. Saturday at 2:00pm I had a signing at the Autograph Table alongside Travis Richey, and happily we both enjoyed a fairly steady stream of fans. 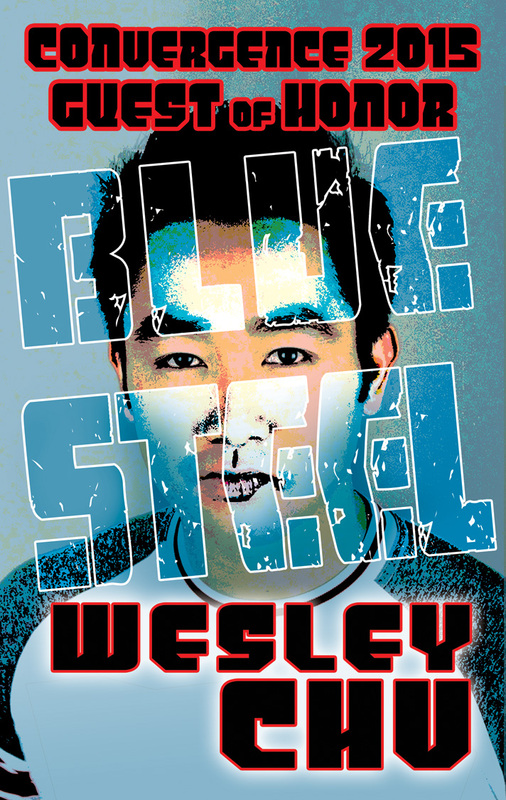 Hopefully I’ll get a couple of signings scheduled for CONvergence 2014. It’s never a convention without cosplayers. Given that I spend so much of CONvergence running around, you’d think I’d get tons of cosplay photos, but I’m actually not too quick on the draw with my camera phone and get far more photos when I’m at an Artists Alley table for the weekend (especially when I have help!). That said, I did manage to snag a photo with some Young Justice cosplayers as I was on my way in to Sunday’s Art: Impossible panel. 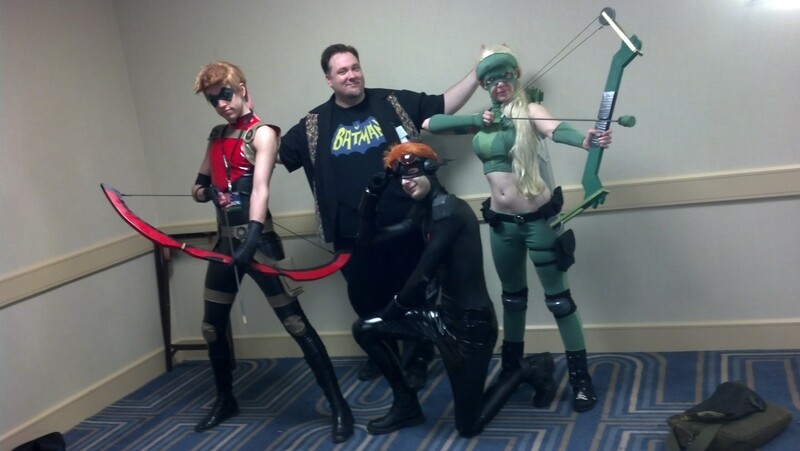 Me with Red Arrow, Stealth Mode Kid Flash and Artemis cosplayers at CONvergence 2013. Photo by Tony Karna. 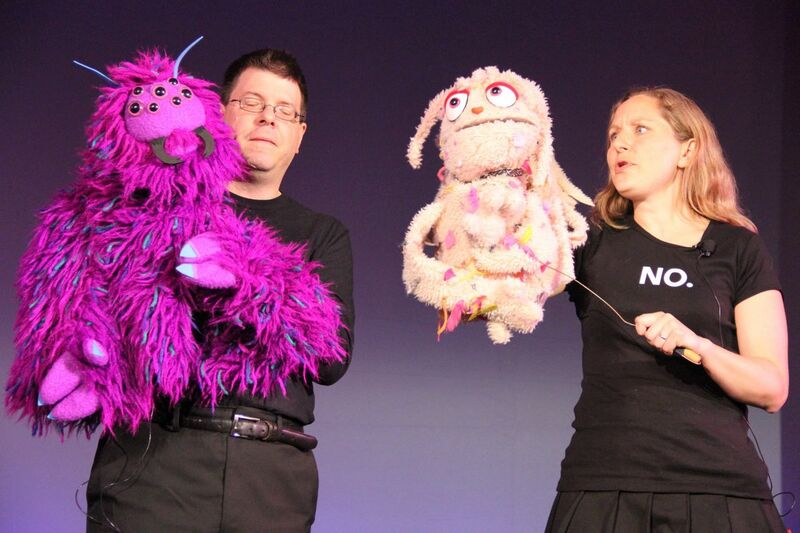 Art: Impossible is our new improv art panel, Emceed again by Tim Wick along with Dawn Krosnowski. (I just can’t seem to get away from those two!) I think the panel was pretty entertaining, with an assortment of artists creating art based on a multiple “challenges” of various lengths. Winners bidders from the previous evening’s art auction got first pick of original art produced during the 90-minute panel. Finally on Sunday was Closing Ceremony which found Connie having a hard time with the idea that she had to wait an entire year for CONvergence to return. 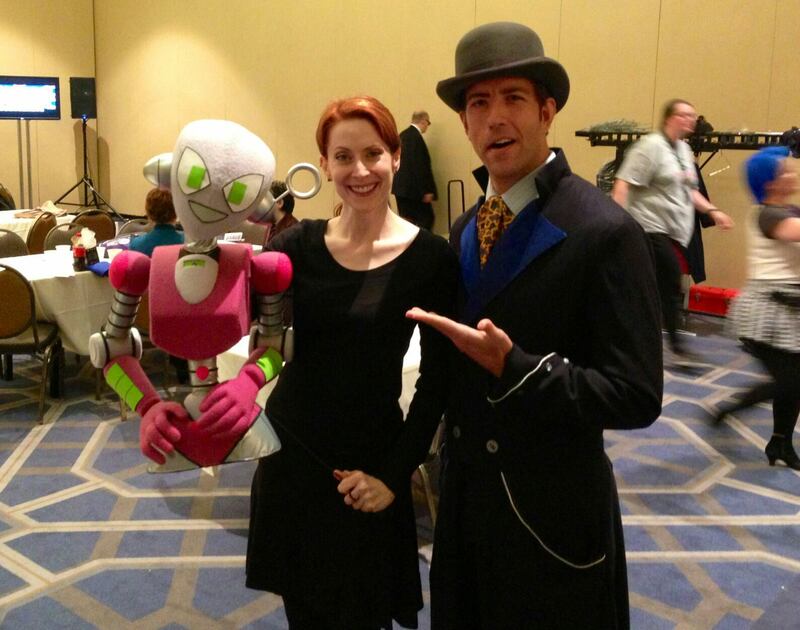 Inspector Spacetime appeared again and offered to take Connie directly to CONvergence 2014 so she wouldn’t have to wait. I’d like to think I added two entries on The Inspector’s roster of Time-and-Space-travelling associates: Caitlin Blackwood and Connie! 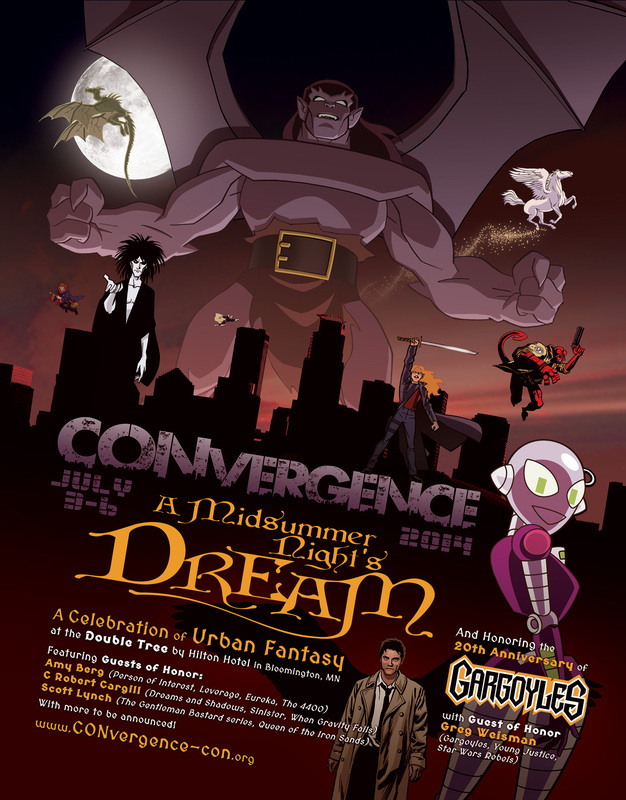 Closing Ceremony ended by previewing plans for CONvergence 2014, which features an Urban Fantasy theme and will spotlight the 20th Anniversary of Gargoyles with a roster of guests that includes Gargoyles show-runner Greg Weisman. 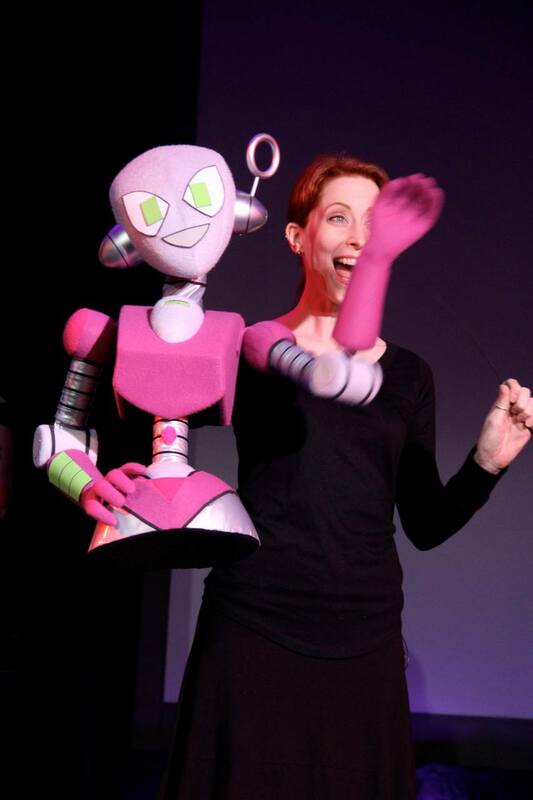 I’m really looking forward to next year’s convention, and part of me wishes I could skip directly to July of 2014 with Connie. Then I remember how much I want to get done between now and then, and I’ll happily take all the weeks I can get! CONvergence 2013 – Guest of Honor Badge Art. Posters I created for CONvergence’s Costumes are not Consent campaign. Christopher Jones is a comic book artist who has worked on DC's Young Justice, The Batman Strikes!, Batman '66, Justice League Adventures; Marvel's Superhero Squad, Avengers: Earth's Mightiest Heroes; Titan's Doctor Who; Re-Animator, Dr. Blink: Superhero Shrink & more! OUT NOW: Young Justice #20 - The INVASION Begins! Preview of Young Justice #14 - OUT WEDNESDAY!